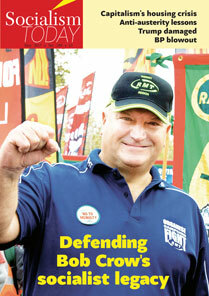 When Bob Crow died in March 2014 the trade union movement in Britain lost one of its best known and most determined fighters. He was far from being only an industrial militant, however. Bob was also instrumental in the struggle to build a new mass party of the working class, a key element underplayed in a new biography reviewed by PETER TAAFFE. Mass protests against Donald Trump in the US have revived many questions around building mass movements, their goals and whether they can be achieved, and what forces need to be mobilised. PAULA MITCHELL looks at the arguments of Ellie Mae O’Hagan, one of the leaders of UK Uncut in 2010. Big business is increasingly taking over the housing sector – social rented as well as private ownership. The results have been devastating as tenants face sky-high rents, fewer rights, worsening conditions, and government policies of aggressive deregulation. PAUL KERSHAW reviews two books linking the current housing crisis with globalisation and the financial markets.